This past weekend I was de-winterizing my front porch, turning it into something more appropriate for Spring / Summer. When your home has a wrap-around front porch like mine, my childhood dream come true 🙂 🙂 , switching it out seasonally can be a big job. Which is why I tend to only change the main decor items 2 or 3 times a year, depending on the Season. Once for Christmas, once for Fall, and once for Spring / Summer. The front door I might change a bit more often depending on the holiday with wreaths (if I am feeling up for it), but for the most part – that’s it. It’s a BIG job, one that I love. But I have had to learn a few tricks along the way to make it work. Some of these tricks include choosing decor that will mesh with numerous seasons, Spring AND Summer. Finding colors that match with my RED home, and securing down all of my decor properly so that it doesn’t blow away because I happen to live in a wind tunnel (and nobody likes storing pillows nightly or finding them in your yard the next day). As I was working on my front porch this past weekend, I realized that one of the things I do regularly might be a cool tip to share. It only take about 5 minutes to do, and saves me months of sanity. 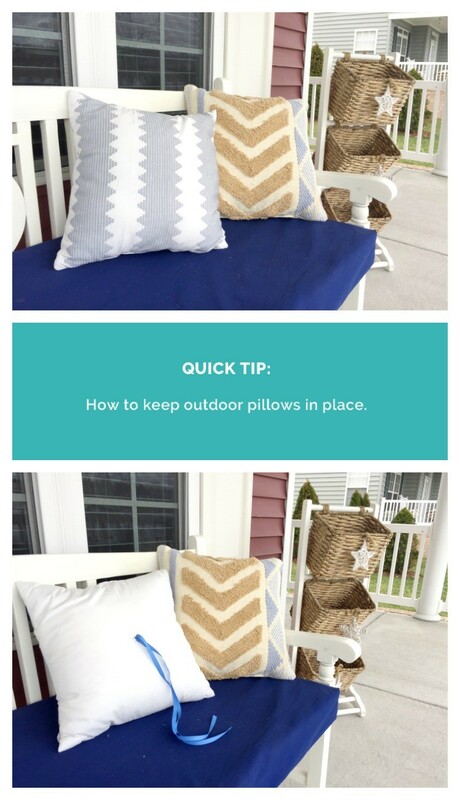 How to keep your outdoor pillows in place || Outdoor pillow DIY.